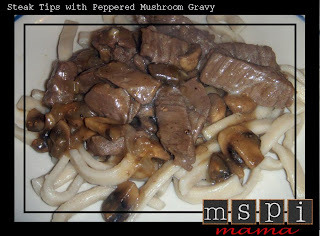 Here's a great comfort food recipe that satisfies cravings for pasta, meat and creaminess. I adapted the recipe from My Recipes. It was originally published in Cooking Light magazine, so it had some "nicer" ingredients, such as shallots and baby bella mushrooms. I had their plainer cousins on hand, onion and button mushrooms, so that's what I used and listed here. Feel free to dress yours up with the nicer ingredients. This would also be a great freezer-friendly recipe. You could easily double the ingredients (except the pasta) when you cook it, reserving half of it for a later dinner. Just cool it down, place it in a freezer-safe package and freeze. Later, just thaw completely, reheat on the stove or microwave, cook the pasta and serve. Cook noodles according to package directions, omitting salt and fat; drain. While noodles cook, heat a large nonstick skillet over medium-high heat. Coat pan with cooking spray. Add steak; sauté 5 minutes, browning on all sides. Remove from pan; cover. Heat oil in pan over medium-high heat. Add onions and mushrooms; sauté 4 minutes. Add garlic; sauté 30 seconds. Stir in Worcestershire sauce. Sprinkle flour over mushroom mixture; cook 1 minute, stirring constantly. Gradually add broth, stirring constantly. Add pepper, salt and thyme sprigs. Bring to a boil; cook 2 minutes or until thickened. Return beef to pan; cook 1 minute or until thoroughly heated. Discard thyme sprigs. Serve over noodles. Tip: This does have a peppery bite, so you might want to scale back the black pepper if your family prefers a milder flavor. This was SO Yummy!! Love your recipes! Thanks so much!